I popped to Boots at lunch with my workmate and we were ambushed by a No7 sales assistant brandishing a minuscule empty bottle for a free foundation sample, I wasn't going to bother as the container was so tiny any sample given would barely cover my nose, and said as much to my friend. The No7 lady heard me and told us that the actual sample container was much larger but they don't use them as incentives on the shop floor as people just pocket the container and don't bother stopping by their counter for the foundation sample...strange! We were sat down and colour-matched, and before she even got started I assured her that I would need the lightest shade, but she insisted on trying the second lightest first. Of course it was orange and so I got a little container of Stay Perfect in Alabaster. 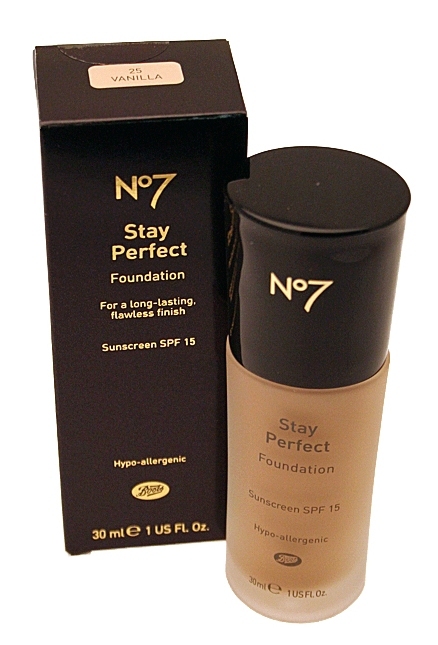 I'm quite pleased to see No7 are listening to customer demand for lighter shades as the Alabaster shade was initially restricted to the Lift & Luminate foundation, and with more pressure it may roll out to the Protect & Perfect liquid foundation. Stay Perfect is best for combination or oily skin and gives medium coverage. I would repurchase it before Lift & Luminate which gives sheerer coverage and is too moisturising for a grease ball like me! The foundation costs £15.50, which I feel is overpriced, but if you can knock £5 off with one of those No7 vouchers Boots give out regularly, it's worth it. I'm just getting started with the sample which looks as though it will last about a week, and will report back. If you're in Boots I recommend picking up a sample as the container they give you is a great size for decanting face or eye cream for travel, even if you don't love the foundation! Tomorrow evening (11th Nov) Boots in Westfield is holding another of those great Christmas Shopping evenings where you get £12 worth of Advantage Card Points for every £50 you spend instore. Good times! I hope the foundation works out for you! Nice post! I find this foundation totally perfect when my skins quite dry - it's definitely less matte than most other foundations I have but I actually like the subtle glow it gives.